West 52nd Street between Broadway and 8th Ave. is one of those anonymous New York City blocks that seems, at first glance, to offer very little other than the entrances to the Neil Simon and August Wilson theaters that dominate the street. Tucked beneath a non-descript red awning beneath the buzzing Neil Simon sign is a piano bar and restaurant called Russian Samovar. The entrance is plain. The awning promises “House of Flavored Vodkas,” which for some drinkers, is not an enticement, conjuring as it does chilling images of whipped cream and birthday cake flavored shots of Smirnoff. The menu posted in the front window boasts an array of traditional Russian fare: caviar and blini, salmon kulebyaka, vareniki, tabaka, beef stroganoff, and of course Chicken Kiev. A climate like Russia’s doesn’t inspire light and delicate fare. 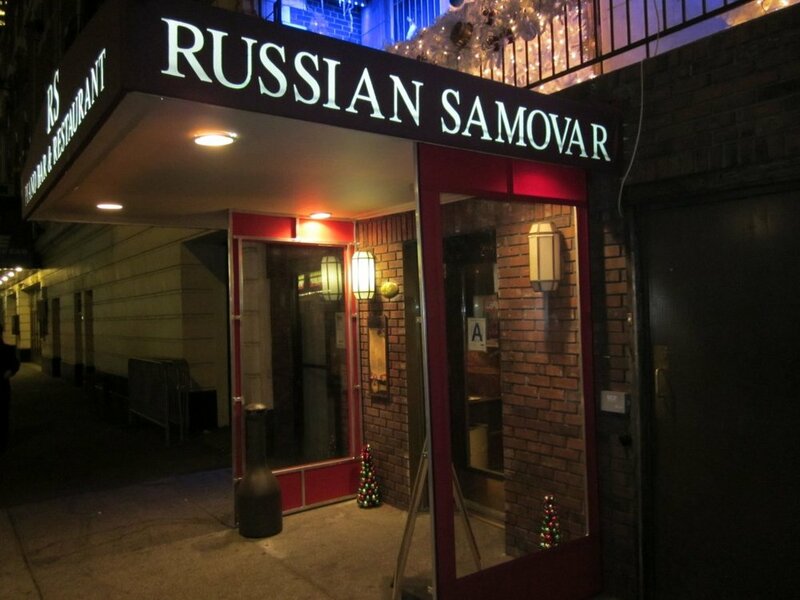 Russian Samovar opened in 1986, a partnership between three Russian expatriates: literature professor Roman Kaplan, famed poet Joseph Brodsky, and legendary ballet dancer Mikhail Baryshnikov. All three men considered themselves “fundamentally pro-Russian, yet vehemently anti-Soviet Union.” They wanted a place where like-minded artists could gather, talk, listen to music, and eat. Though most of the world didn’t realize it at the time, the Soviet Union was only a few years from dissolution, the Berlin Wall -- a chunk of which used to sit a few blocks away on 53rd Street between Fifth and Madison Avenue -- just a couple years from being overwhelmed and sledgehammered by jubilant Germans. For many members of the Soviet diaspora who found themselves in New York City, Russian Samovar became a de facto home far away from home, where everything from politics to poetry was discussed over hearty dishes and glasses of vodka. The Soviet Union is gone now; but Russian Samovar is still there. Through the door, away from the crowd waiting to see Jersey Boys across the street, one is greeted by red boudoir lights, like something a saloon madame might have once worn, and on the right, a long wooden bar behind which is arranged, among other liquors, some fifteen different house-infused vodkas. The vodkas came in the 1980s but the wooden bar has been there since the 1960s, when the place was called Jilly’s Saloon after its owner, Italian-American entrepreneur Jilly Rizzo. Jilly’s was famous for a number of reasons, but two stand out above all others. One, someone decided there to murder Johnny Carson; and two, when Frank Sinatra was in New York, it’s where he would set up court, dining there several nights a week flanked by friends and associates while three waiters and Jilly himself ran interference on anyone hoping to drop by Frank’s booth without an invitation. Despite having served as an icon for high living for generations, Frank Sinatra was not a fan of haute cuisine. A high school drop-out from Hoboken, New Jersey, the only child of a father who was a lightweight boxer turned fireman and a political activist mother who ran an illegal abortion business that provided services for free, Sinatra even after his fame was established preferred simpler fare and cozier surroundings than were found in the five-star restaurants of the world. In New York he favored only a few establishments, none of them popular celebrity hang-outs (except for the celebrities invited by Frank). There was P.J. Clarke’s at 915 Third Ave., where Sinatra carefully scheduled his nights around those of gossip columnist Dorothy Kilgallen, whose favorite topic was anything going wrong in Sinatra’s life, especially if it concerned the disillusion of his relationship with actress Ava Gardner. Then there was Patsy’s at 236 W. 56th St., where Frank ordered the breaded veal and spaghetti with red sauce on the side. As a story goes, Sinatra found himself on the skids one Thanksgiving, without company and without plans. So he made a reservation at Patsy’s, which wasn’t open that day. But owner Pasquale Scognamillo scrambled his staff and family so that when Frank rolled in at 3pm, the place was full. Rocky Lee Chu-Cho Bianco at 987 Second Ave was where Frank would go for pizza, and if he wanted something a little more upscale, he hit the 21 Club over at 21 W. 52nd St., where the jacket and tie dress code was a lot less of an issue in the 1950s than it is now. But above and beyond them all was his affection for Jilly’s Saloon. Born Ermenigildo Rizzo on May 6th, 1917, Jilly’s career in food services started early, when he worked for his father delivering Italian ice to cafés. He opened his first restaurant, Jilly’s Saloon, on West 49th Street but eventually moved it to a new location on West 52nd. It was this second incarnation of Jilly’s that attracted Sinatra’s attention. On any given night, Sinatra could be found at his regular booth surrounded by regular friends who received the call earlier in the day -- having grown up an only child, Sinatra swore he would never dine alone. Jilly’s kitchen specialized not in Italian fare but in Cantonese food. Sinatra spent so much time there that Jilly Rizzo became Sinatra’s closest friend, his right-hand man, and his bodyguard. 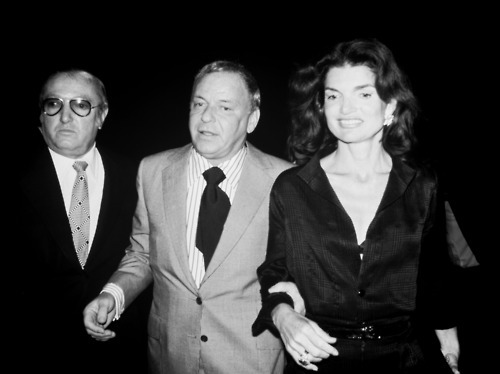 Jilly and Frank with their pal Jackie O. Apart from being Sinatra's throne room, Jilly's was most famous as the spot where mobsters decided to murder television comedian Johnny Carson. Part 2 can be read here.